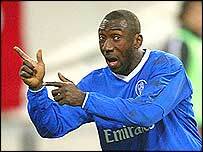 Jimmy Floyd Hasselbaink marked his 32nd birthday with a superb late hat-trick to salvage a precious win for Chelsea. The hosts made a dream start when Joe Cole set up Mario Melchiot, but they were pegged back by Wolves when Henri Camara latched on to a John Terry slip. A Jody Craddock header put the visitors briefly in front, but Frank Lampard got Chelsea on terms with a 25-yarder. Hasselbaink then scored with three thundering drives, becoming the third foreigner to net 100 Premiership goals. In the face of growing speculation about Claudio Ranieri's future, fans at Stamford Bridge rallied behind their manager with banners and extended chants at the start. Ranieri, for his part, returned to his "Tinkerman" ways, making five changes to the team that drew 1-1 with Arsenal in the Champions League on Wednesday. His shake-up had an almost immediate effect, with the recalled Cole freeing Melchiot - himself on a rare recent start - to steer the ball coolly past Wolves goalkeeper Paul Jones. Chelsea continued to dominate possession as Wolves struggled to break out of their half. Lampard, becoming only the third outfield player to rack up 100-straight Premiership appearances, picked out Hernan Crespo, who fired spectacularly wide. Moments later, though, the scores were unexpectedly level. A careless lapse by John Terry let in Camara, who scuffed his shot over the legs of Marco Ambrosio. Camara should then have given Wolves the lead, but he dragged his shot wide when it looked easier to hit the target. And Kenny Miller also spurned a glorious self-made chance. Eidur Gudjohnsen was replaced by Damien Duff at half-time, with Cole intriguingly pushed up front to partner Crespo. But Wolves scored next thanks to a 57th-minute header by Craddock. Ince, who had passed a late fitness test, drove the visitors forward in search of a famous away win. But he was also called into action at the defensive end, blocking a rocket of a shot from second Chelsea substitute Hasselbaink. He could do nothing, however, when Lampard struck a rasping 25-yarder into the bottom corner of Jones' net to equalise. Wolves were left trying to cling on to their point, but Hasselbaink had other ideas. The Dutchman marked his latest goal-scoring milestone with a trademark piledriver. And Hasselbaink made the points safe 10 minutes later after more good work from the impressive Duff. He then converted a one-on-one with Jones to round off a spectacular substitute appearance, before tempers flared at the final whistle. Chelsea: Ambrosio, Melchiot, Terry, Gallas, Babayaro, Geremi (Hasselbaink 60), Lampard, Makelele, Cole (Parker 80), Crespo, Gudjohnsen (Duff 45). Subs not used: Sullivan, Huth. Wolverhampton: Jones, Clyde, Craddock, Butler, Naylor, Camara, Ince, Rae (Cort 84), Kennedy (Newton 73), Miller (Cameron 84), Ganea. Subs not used: Oakes, Irwin. "Just another regular day in the soap opera world Chelsea live in"
"We have to keep on winning our games"